My Dad would love this classic stylish toothpick case. It’s a really nice inexpensive holiday gift. I can just see him slipping it right into his shirt pocket after indulging into a great meal. This item would make the prefect holiday promotion for dentistry and oral care services, for restaurants and food industries, for hotels, bars, travel agencies, airlines and more. 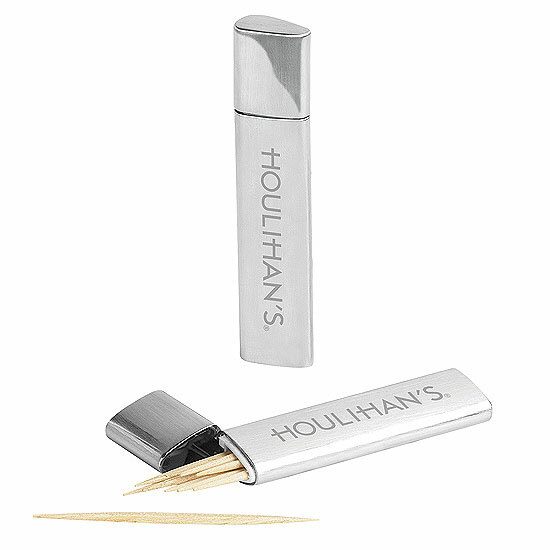 The Stainless Steel Metal Toothpick Case has a sleek design. It’s an elegant stainless steel toothpick holder with a smooth polished exterior that fits perfectly into your pocket or purse. Includes regular size toothpicks. And this is truly a recession buster for low cost holiday shoppers. This makes holiday gift giving easy. The cost has gone down from over $6.00 to now as low as $1.56. Price includes one location laser engraving.